This post was created to help you better understand Canvas quiz settings and how they can be used to maximize quiz security. There’s no way to 100% guarantee students aren’t cheating, but there are steps you can take to reduce cheating by strategically using your quiz settings. Please note that in some cases, not allowing students to review incorrect answers can hinder learning, so think about the goals of your quiz and the positives and negatives of each setting. You can allow students to have multiple attempts to take a quiz. You can then decide which quiz score to keep – highest, latest, or average. If you leave the number of allowed attempts blank, students will have unlimited attempts that would only be stopped by the Available Until date. Unless you have a large bank of questions and/or your quiz goal is content mastery, multiple quiz attempts does not create a secure quiz experience. You can allow students to view the following after they submit a quiz. Quiz questions and answer choices. Answer choices selected by the student. If the student got a question wrong or partially wrong. All question feedback will appear regardless of available/available until and due date, and if the correct answers are not made available. 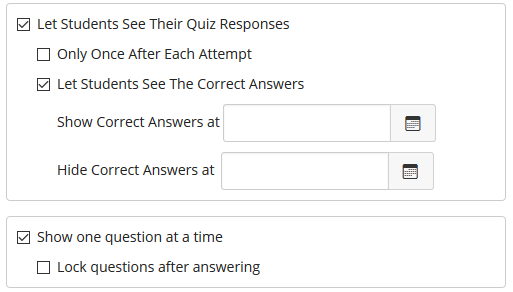 If you allow students to see their quiz responses, additional options appear. If multiple attempts with a specific number of attempts are allowed, you can remove the ability for students to see quiz results other than the score they got on each attempt until they take the quiz for the final time. If you allow multiple attempts, this setting is best for keeping the quiz secure; however, this information isn’t date and time controlled, so students could use all their attempts, note the question information, and then share the information before the quiz is finished. You can allow students to view quiz questions and answer choices, answer choices selected by the student, wrong or partially wrong questions, and question feedback once after they submit the quiz. This is helpful when a quiz is proctored as students view quiz feedback, but it’s only visible immediately after submitting the quiz. If the students return to the quiz later, the score will be available, none of the other quiz information will be. Please note that this setting will override the Let Students See The Correct Answers setting. You can determine when students can view the correct answers to a quiz. Students will be able to view quiz questions and answer choices, answer choices selected by the student, wrong or partially wrong questions, and question feedback, but the correct answers won’t be visible until the date and time you determine. To help keep your quiz secure, it’s recommended to use this feature after the quiz available until and due dates have passed and limit how long correct answers are visible. You can limit the number of questions students see at a time while taking a quiz to one question. It’s recommended to use this feature along with Lock questions after answering. When used together, the students are required to answer each individual question before moving on to the next and it prevents them from going back and changing answers. Please be sure you want to use this feature because students may not like only seeing one question at a time or being prevented from changing a previous answer. Creating question groups allows you to pick a random number of questions to appear on student quizzes. In addition, question groups automatically randomize questions, which makes it unlikely students will have the same questions or have the same questions in the same order. You can randomize the order of question answer choices. By shuffling answers, the same quiz questions may appear, but the answers probably won’t be in the same order. Please note that it’s not recommended to use this feature if your quiz contains answer choices such as all of the above/below or answer A and C.
You can determine the amount of time students have to take a quiz. When determining a time limit, estimate the average time a student needs to answer each question, taking into account the different types of questions in your quiz. If the quiz is being taken in a non-proctored environment, the time limit can be used to limit the amount of time students have to look up answers and/or share questions with other students. If students need extra time or an extra attempt, you can allocate these from Moderate This Quiz. You can specify a code that students must have in order to take a quiz. This feature can be useful during proctored quizzes and is useful if students are taking an untimed quiz and don’t finish it in one class period. You can add or change the access code after a quiz has started, which will lock students out of the quiz until the new access code has been entered. You can ensure your students are taking a quiz in a specific location. This feature is useful during proctored quizzes. 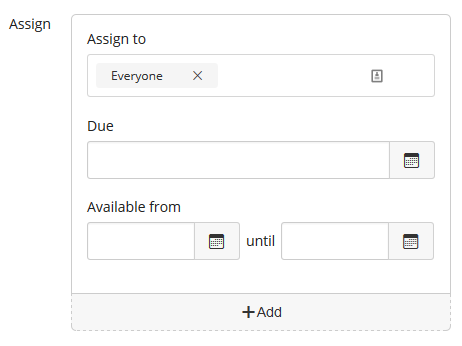 Do not use this feature without speaking with your Canvas admin first. Contact LDT before using this feature. You can require your students use LockDown Browser to take a quiz. 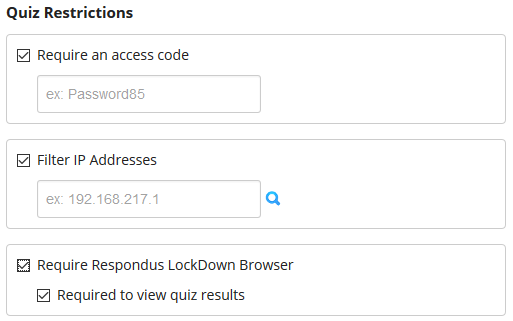 LockDown Browser is a special browser that locks students into a quiz. Students log in to Canvas through the browser and while they’re taking a quiz, they are unable to navigate to another webpage, print, or right click. They are stuck in the quiz until completion. You can even require students to use LockDown Browser to view the quiz results. To help maximize quiz security, it's recommended you have a quiz open the least amount of time as possible. You can specify a date and time when a quiz is due. This date doesn’t keep students from taking a quiz, but quizzes submitted after a due date are marked late in SpeedGrader and in the Gradebook. A due date also appears on students’ calendars and to-do lists. To remove the ability for students to take a quiz after the due date is to make the due date and available until date the same. If students are allowed to take a quiz after the due date, leave the available until date blank or set it to the furthest date and time allowed by you. You can specify a date and time that a quiz becomes available to students. Students won’t be able to access a quiz before this date and time unless it has been manually unlocked, which is a feature available in Moderate This Quiz. You can specify a date and time that students can no longer take a quiz. If the available until date occurs after the due date, students can still take a quiz until the available until date, but it will appear as late in SpeedGrader and the Gradebook. Canvas automatically submits a quiz at the available until date and time even if students are in the middle of taking a quiz. 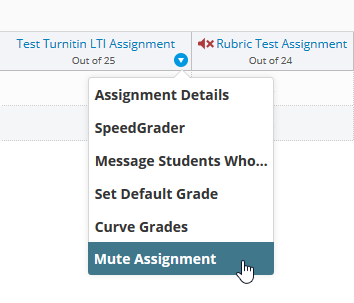 To prevent students from viewing their quiz scores, mute a quiz through Grades (before students begin taking a quiz). Please note that muting a quiz will override your quiz settings related to feedback. No quiz feedback will appear for students. This includes their responses to questions or correct answers. This information will appear once a quiz is unmuted. One final note, please make sure your quiz is published. Students won’t be able to take or see a quiz regardless of the available from date if it’s not published. For more information about quizzes, watch this Canvas webinar, Feel Secure about Your Relationship with Quizzes. Please contact us with any Canvas questions. This entry was posted in Canvas: Quizzes and tagged correct answers, dates, multiple attempts, question groups, quiz, quiz responses, Quizzes, Restrictions, security, shuffle answers, shuffle questions by . Bookmark the permalink.